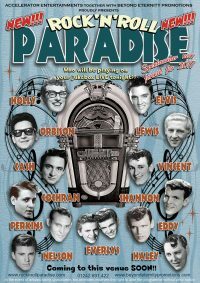 In 2019 Rock ‘n’ Roll Paradise celebrates it’s 10th anniversary! Each show will be crammed full as always with the country’s best tributes to rock ‘n’ roll’s stars, performing the very best songs ever written and supported by the explosively dynamic Paradise Band. 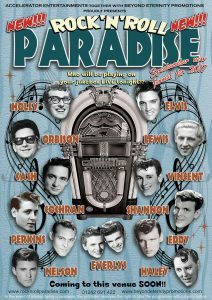 Amongst those ‘appearing’ will be Gene Vincent, Ricky Nelson, Buddy Holly, Jerry Lee Lewis, Roy Orbison, Johnny Cash, The Everly Brothers, The Big Bopper, Eddie Cochran and even the king himself – Elvis …… the question is, who will you be lucky enough to see?